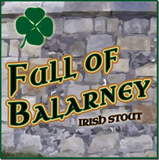 Full of Balarney Stout is the first Nitrogenated beer Terrapin has ever produced. Terrapin’s first nitrogenated beer, hearkens to the traditional stouts of the Emerald Isle with its deep ebony hue, big roasty aroma, and clean, dry finish. Flaked barley and roasted malt give this dark, but light-bodied, brew a silky-smooth mouthfeel.